Fans of Solar Impulse 2, the SunPower® solar cell powered airplane, are celebrating the plane’s safe landing in Hawaii today following the most dangerous leg of its around-the-world journey: more than 5,000 miles across the Pacific Ocean without a drop of fuel. 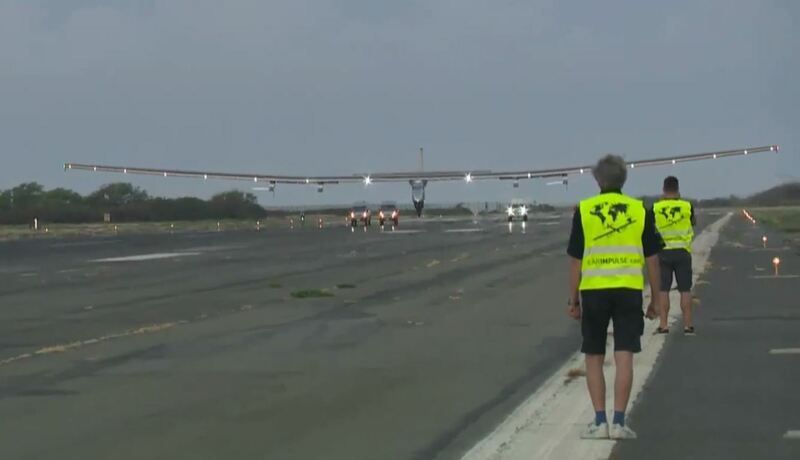 The trip from Japan to Hawaii broke world records for longest solo and solar flight when pilot André Borschberg landed at Kaleoloa Airport on O’hau after flying five days nonstop. How fitting that the plane, a project born in Switzerland to Borschberg and his partner Bertrand Piccard, landed on American soil on the eve of our Independence Day. Borschberg, Piccard and their support team have been unwavering in demonstrating the kind of adventurous spirit that characterizes our country and its founders and that typifies the groundbreaking innovation that 30-year-old SunPower was founded upon. At moments completing this perilous flight seemed impossible. The Hawaii flight had originated in China but was unexpectedly grounded for three weeks in Japan due to poor weather. All eyes were on the Solar Impulse team, wondering if the journey, which originated in Monaco in March, would have to be put on hold indefinitely. One attempt to take off from Japan, watched live online by the world, was aborted at the last minute, and the stress and disappointment faced by all was palpable. Their caution was understandable as the dangers to the pilot and aircraft were all too real. If the plane hit bad weather over the vast Pacific, Borschberg would have nowhere to land. He might of had to ditch the plane and escape via parachute into a life raft. Yet the team members persevered, working day and night to find a safe weather window for the plane to fly. Their determination was admirable and brings to mind many explorers from before, especially Amelia Earhart, the first woman aviator to cross the Atlantic solo. It’s bittersweet to note that the July 2, 1937 anniversary of Earhart’s disappearance over the South Pacific occurred on one of the most difficult days of Borschberg’s flight, as he faced exhaustion and turbulence while trying to find a safe spot to cross a cold front. We hope Borschberg’s success honors her memory. The theme of freedom rings true. Freedom to do what no one has done before: Fly alone for days in a cold cramped unpressurized cockpit to tell the world that the free power of the sun means what the hashtag on the plane's fuselage clearly states: #TheFutureisClean. SunPower’s Maxeon® solar cell technology, the same technology we use in our residential and commercial panels, was selected for Solar Impulse because of its industry-leading efficiency, weight and thickness, an average of only 135 microns, which is critically important for the power-to-weight ratio of the aircraft. The solar cells power the electrical engines of the plane while recharging lithium batteries for night flying. We’re proud to note that the airplane’s solar technology, comprised of more than 17,000 SunPower cells, performed better than expected, according to the Si2 team. The Solar Impulse team said during this leg of the flight the plane was using an average of 16W/h per kilometer, compared to some energy efficient cars, which use 237W/h per kilometer. It's also worth noting the significance of Solar Impulse resting in Hawaii, a state that's lush with environmental beauty and scientific significance. Hawaii is one of two U.S. states that recently passed legislation that will require significant increases in renewable electricity generation – giving them both the highest such targets in the country. The journey isn't over. Next stop: The U.S. mainland, the sunny city of Phoenix, and onward, with some not-yet-disclosed visits to places including Southern Europe or Morocco and finally ending where it all began, in Abu Dhabi. As we celebrate our Independence Day, we celebrate the unstoppable spirit of the Solar Impulse team and their willingness to take great risks to spread the word about the free clean green power of the sun.